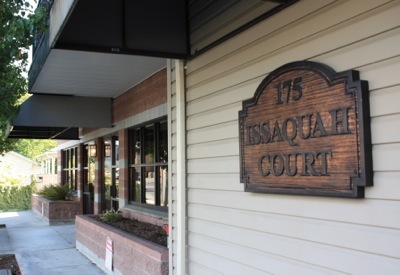 Issaquah Court, located in downtown Issaquah, is a three-story mixed-use condominium building with four commercial units at the ground level and 16 residential units on the two upper floors. Wagner Management built this building in 1998, sold the residential units and manages the commercial spaces, which are presently occupied by a professional photography studio, speech and language pathology clinic, and hair salon. One space, formerly occupied by a doctor’s office, is presently available for lease. This building is located one block from historic Front Street in downtown Issaquah, featuring a variety of restaurants and local retailers. Easy access to I-90.